Waiting is the name of the game this week. No leaves yet on most of the trees. Spring teases us here -- frosty mornings and only a few sunny days so far. 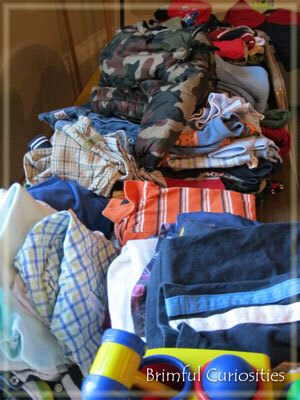 I'm preparing for a garage sale and mounds of clothes also await marking. Garage sales are a lot of work! Good luck prepping! Spring is in full bloom for us down here in Atlanta for a while now. I don't miss living in the cold of Chicago! 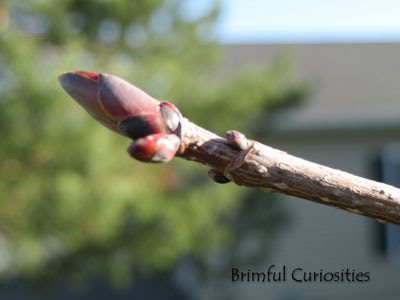 That bud is just ready to pop though! I hear ya! We live in Nebraska, so it's been cold here too. I'm also going to have a garage sale sometime in June. Ahh that is so weird. Last week we were melting with high 80s and 90s and this week. down to 60s!!! I hope soon you'll get to see the beautiful Spring come forth. Spring is slow emerging here as well. The flowers are here, grass is green and there are leaves on the trees, but it's still a bit chilly outdoors. I'm preparing for garage sale too. I love seeing my stuff go to new homes...and the cash in is very nice! Garage sales are truly a lot of work if you want it done right & unless you have the room you're going no where. Good luck. We love going to garage sales so I know your's will be a huge success. Hope you see tons of leaves soon!